Acacia Motor Lodge is found on the southern edge of the town centre and is hard to miss with its tall sign and flag pole, flying the Australian Flag. Acacia Motor Lodge can be found on the Newell Hwy at the southern end of the town centre on the right hand side, opposite the centre link and warrumbungle community care office. 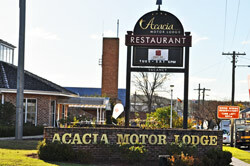 Acacia Motor Lodge can be found on the Newell Hwy just down from the Shell Service Station and next to the Chinese restaurant on your left hand side.